Source Text — Search in source language (English). Target Text — Search in translations. Comments — Search in comments (these are the comments provided by both engineers and localization managers. Locations — Search in special attributes provided by our localization system. 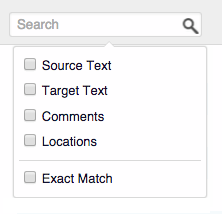 Exact Match — Search for the exact phrase. When this flag is turned off, we will find units containing all provided words, but not necessary in the same order. When parameters are set, click on the magnifying glass icon to begin your search. NOTE: Search is always performed within the current browsing/translation context — a combination of language, project, and folder/file. All these context parts are optional. Depending on your current selection, you may search within the entire translation database, or within your language across all projects, or within a project across all languages, or in a specific folder or file. It is always more effective and faster to browse into a specific language, project and folder and search from there. In the next section you'll learn how to view your translation statistics.